Prior to the digital revolution in electronic instrumentation, oscilloscopes displayed waveforms on cathode ray tube screens. Modern digital oscilloscopes universally have flat screens. The flat screen is light, thin, consumes far less energy, and is less expensive to manufacture. All agree that it is a great improvement. The one advantage of CRT technology is that it is easier to understand. A CRT from a television with its electron gun and coils visible. The flat screen display produces a similar end product, responding to time base and signal amplitude. But there is no electron gun or electron beam. 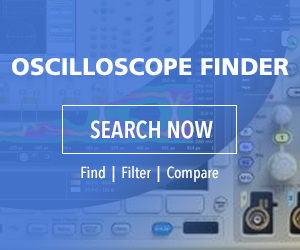 Because of its low cost, ease on the eyes and great portability, oscilloscope manufacturers will probably not be looking at competing technologies. For a few years, plasma panels were common. A plasma display is made up of two glass plates separated by a thin layer of neon or similar gas. The plates have parallel electrodes situated at right angles to one another. Applied voltage causes the gas to glow and thus the image is formed. Voltage applied to the crystals counteracts the effect of the alignment layers, causing the crystals to straighten out so the screen goes dark. All this happens individually at a pixel level, and that is what creates the display. There is no gun or vertical and horizontal displacement and scanning as in a CRT. Overall the flat screen, using LCD technology, compared to the CRT, is less expensive. And there is less shock and implosion hazard and less heat dissipation, so it is easy to see why flat screen has displaced CRT usage in oscilloscopes, computer monitors and TVs. What makes an LCD work is that varying amounts of voltage cause the liquid crystals to rotate different amounts so that the light is polarized at discrete angles. If polarized light is rotated with respect to a polarizing filter, its intensity after passing through that filter is modified. We can demonstrate this behavior very easily by removing the lenses from polarized sunglasses. Looking at a light source (not the sun!) through both lenses, its brightness will be seen to change as one lens is rotated with respect to the other. The first lens polarizes the light and the second lens blocks a portion of it. Polarizing glass was originally manufactured by engraving closely-spaced lines on it, but now this is done by chemical means.